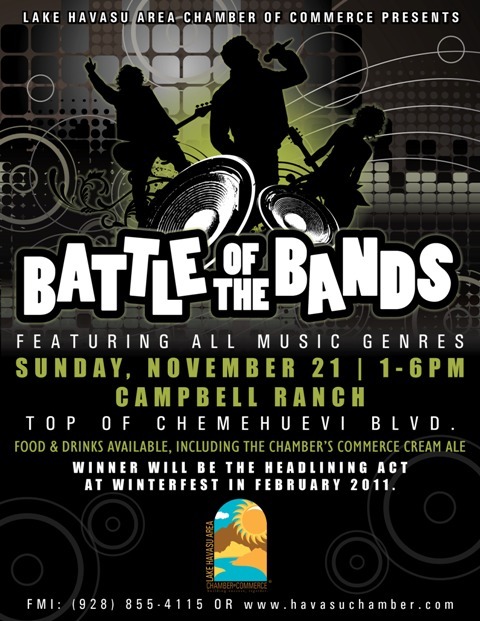 Local bands alert: The Lake Havasu Area Chamber of Commerce is looking for competitors for its inaugural “Battle of the Bands” Competition. 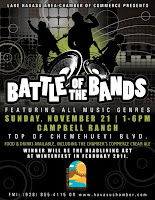 The event will be held Sunday, Nov. 21 from 1 – 6 p.m. at Campbell Ranch. Hopeful participant bands will be accepted through 5 p.m. Monday, Nov. 15. Chamber officials will then conduct a lottery-style draw on Tuesday, Nov. 16 at 2 p.m., and the first six bands drawn will be selected to perform. Both instrumental and vocal performances are a requirement for the bands. At the event, the selected bands will perform a 30-minute set. Three judges will choose the winner based on five components: Music, Stage Presence, Appearance, Original Material and Crowd Applause. The winner will go on as the headlining act at the 26th Annual Winterfest Street Festival, set for Saturday and Sunday, Feb. 12-13, 2011. The group will perform during prime hours at Winterfest. Typically Winterfest attracts around 35,000 local residents and visitors to up-town McCulloch Boulevard over the two days of the festival. The general public is welcome and encouraged to attend Battle of the Bands and cheer on their favorite groups. Admission is $15; children 12 and under are free. Food and beverages, including the Chamber’s Commerce Cream Ale anniversary beer will be available for purchase. For the complete Rules of Engagement for the event, please contact the Chamber at 855-4115, visit www.havasuchamber.com, or find event details at http://twitter.com/HavasuChamber or http://www.facebook.com/havasuchamber.